Technically the U.S. left the gold standard in 1971 but, in reality, we abandoned it in 1913 with the creation of the Fed…setting the stage for the collapse of the dollar. [Given that this is] the 100th anniversary of the creation of the Federal Reserve, it seems only fitting that we should present a brief history of the U.S. dollar debasement since then. Our first Coinage Act establishes a uniform standard of gold and silver content of U.S. coins, paving the way for over a century of trust in the U.S. dollar that will ultimately catapult the U.S. to world economic supremacy. In desperation, and in direct violation of the U.S. Constitution, both the north and south issue paper currency with no gold or silver backing. Following the war, the U.S. returns to its constitutional roots, ceasing production of Greenbacks and making efforts to retire them as the U.S. returns to the gold standard…. The stage is now set for the collapse of the dollar…. After 23 years of dollar debasement by the Fed, Franklin Roosevelt is forced to acknowledge the growing disparity between the century-old fixed price of gold ($20.67/oz.) and its market price. The rift is made painfully obvious by the outflow of U.S. gold into the coffers of foreign nations redeeming dollars for gold at the stated fixed price. In direct violation of the U.S. Constitution, Roosevelt and Congress not only remove gold from circulation but prohibit ownership of gold by U.S. citizens. With the stroke of a pen the dollar is devalued from $20.67/oz. to $35/oz…. In the belief that the world requires a unified monetary standard in order to eliminate trade wars that ultimately lead to shooting wars, leading nations establish a dollar-based monetary system in which currencies are valued in terms of the U.S. dollar, which still claims to be gold-backed. This unwarranted trust ironically gives the U.S. yet more license and incentive to continue its debasement, since the world’s citizens now accept newly printed dollars with the mistaken notion that they can be redeemed for a fixed amount of gold…. In this same speech Johnson states that scarcity of silver is the motivation for the change…. In a repetition of the 1934 crisis, the U.S. gold supply is being decimated by foreign governments redeeming dollars for gold at the stated fixed price ($35/oz. ), a completely untenable ratio after thirty more years of dollar debasement by the Fed. In direct violation of the U.S. Constitution, Richard Nixon and the Congress once again stop the outflow, but this time rather than set a new unmaintainable fixed rate they simply eliminate the fixed dollar/gold ratio. Realizing that the collapse of the gold standard will dramatically reduce demand for dollars worldwide, Nixon strikes a deal with OPEC: trade oil in dollars only in return for perpetual U.S. military support. By 1974 gold is irrelevant to the U.S. hegemony, and so, as his final act of the year, Gerald Ford signs a bill that once again allows U.S. citizens to own gold…. Shortly after the creation of the Euro, Saddam Hussein makes Iraq the first major oil exporting country to sell oil in a currency other than the dollar, thereby threatening the global petrodollar arrangement. Citing this “weapon of mass destruction” while misleading the public into a preposterous belief that he is really referring to conventional weapons that could somehow threaten the U.S., George W. Bush reacts swiftly by invading in 2003 and quickly reverting Iraq to dollar sales. To make our point exceptionally clear to world leaders, the U.S. (using proxies) hunts down Hussein and executes him in 2006…. Under Barack Obama, Fed chairman Ben Bernanke begins a series of bailouts of banks (that are presumably Fed members) and of U.S. debt (both mortgage-backed securities and U.S. Treasurys)…. The master of dollar-printing is 100 years old. The Fed marks its birthday by engaging in the largest debt purchase program in history ($40 billion of mortgage-backed securities and $45 billion of Treasurys per month). Awaiting the collapse of the petrodollar arrangement and the subsequent radical reduction in the purchasing power of the dollar, the price of gold is bid up to over $1600 per ounce…. 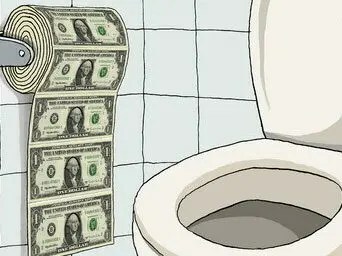 The dollar will almost certainly continue losing purchasing power indefinitely, in terms of both commodities and other currencies, and when the oil-producing nations finally agree to accept payment in currencies other than the dollar, expect a precipitous drop. Invest accordingly. Those that fail to heed histories lessons will continue to be unhappily surprised by history! If you don’t plan ahead, you will be beholden to those that due!